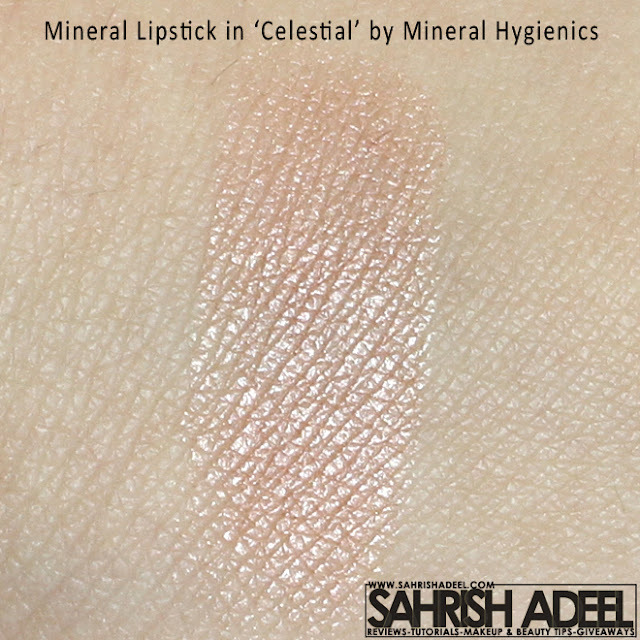 Mineral Lipstick in 'Celestial' by Mineral Hygienics - Review & Swatch! | Sahrish Adeel - Malaysia based Pakistani Beauty & Lifestyle Blogger! 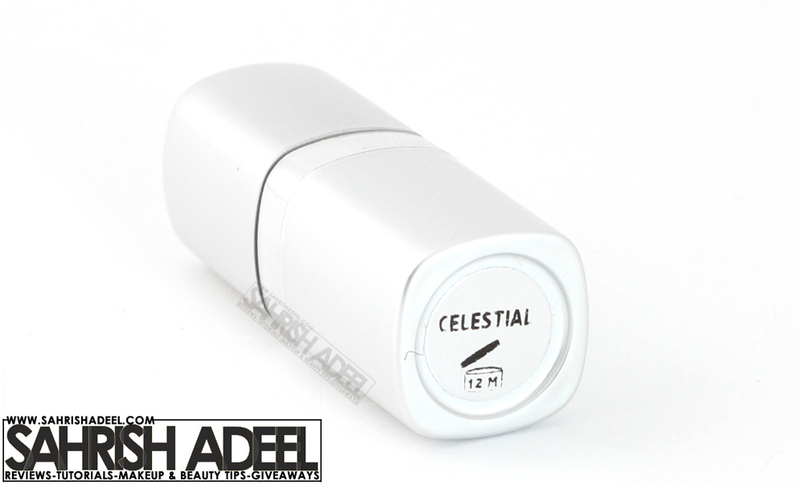 Mineral Lipstick in 'Celestial' by Mineral Hygienics - Review & Swatch! Mineral Hygienics have always impressed me with their products. This time I tried their lipstick for the first time and I am glad to find that this is absolutely my kind of lipstick. The one I would comfortably wear everyday. You want to know why? 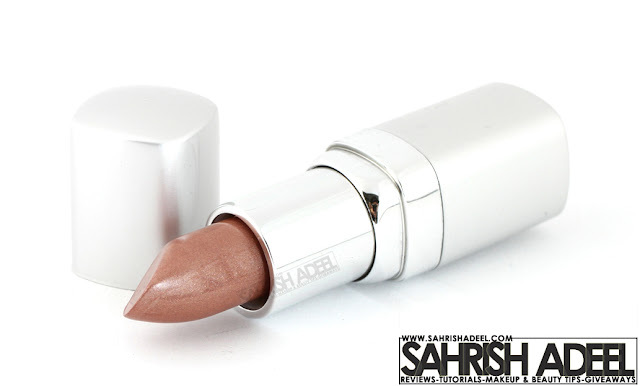 This lipstick has a really light pink to peach undertone with a very light shimmer. This shade is also named as Champagne for obvious reason. The body is made up of plastic like the usual lipsticks. It is about two inches+ tall which looks pretty cute. This lipstick comes in five different shades. The product was sealed and reached me safely and nicely packed in a box with lots of packing material. Ricinus Communis(Castor) Seed Oil, Caprylic/Capric Triglyceride, Lanolin, Euphorbia Cerifera(Candelilla) Wax, Lanolin Oil, Mineral Oil, Copernicia Cerifera(Carnauba) Wax, Ozokerite, Ceresin, Tocopheryl Acetate (Vit. E), BHT. Stays for about 2-3 hours. This lipstick makes you look fresh instantly. Does not leave residue on sides of the lips. Has a really light scent. Does not have any taste. I have been using Foundations, Bronzer & Finishing Powder by Mineral Hygienics for a long time. These products are in my favorites for their quality and result. If you are reading my blog for quite some time, you might have noticed that I am more of a lip gloss person. Either I use a lip gloss alone or use it on top of a lipstick. Since I tried Signature Lipsticks by Luscious Cosmetics (review here), Lipstick by MUA (review here) and now this Mineral Lipstick by Mineral Hygienics, I must say that I am loving them all and I have started using the lipsticks alone. This Mineral Lipstick in 'Celestial' is very nice lipstick with a really subtle shimmer and sheer finish. The finish is more like a lip balm. I really like that it keeps the lips moisturized for long time and even stays on lips for about two to three hours (without eating) which is good. The pink to peach undertone with shimmer looks really natural on lips and the lips instantly look smooth and fuller by giving a fresh look to the face. One thing that irritates me alot when using lipsticks is that they leave a dirty looking residue on sides of the lips, even when the rest of the lipstick has come off. This lipstick does not give that problem at all and stays smooth all the time. It also does not have a taste and the scent is way to light to notice, loved this feature. Overall, I am really happy with this product. This product is suitable for people of all ages and skin tones as the neutral shade enhances your own lip color and adds just enough shine and freshness to make you look good. People who are sensitive to chemicals should also try this lipstick as it does not contain much chemicals and is safe for everyday use. This Mineral Lipstick costs $12 and you can buy it by clicking here. To view other shades in this lipstick, click here. You can also check out the rest of their range over here. Mineral Hygienics ship worldwide. Mineral Hygienics also give their customers reward points on every purchased item that can be utilized on future purchases. Doesn't it sound like double discount? Have you tried any product by Mineral Hygienics before? Share you experience.